Conservation Action Project: Thanks Wayne! 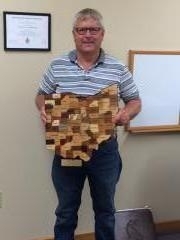 CAP would like to thank Wayne Noffsinger for serving as President in FY 2014-2015. Wayne has been a board member on the CAP board of Trustees the past eight years. He is the Branch Manager for Helena Chemical Plant in Continental.